ŽIJEMVEDU.SK (= I live Science) is an apolitical platform with the main original goal: to connect Slovak scientists over the globe in order to mediate their collaboration. We also want to increase the awareness about the importance of science and technologies among public, as well as political authorities. The support of R&D and education in general, has been constantly insufficient in Slovakia throughout the years, resulting in the marginalisation of science and an enormous brain drain. This means a catastrophe for the society in the long perspective. We are calling for the essential reform of the education system as well as the science policy in our country. The web page zijemvedu.sk links preferentially Slovak scientists living either in Slovakia or abroad and now has 260 members. The facebook group Zijem vedu has already more than 1100 members and consists of researchers, but also teachers, students, science fans and everyone who likes to help Slovak science and education to survive and progress. 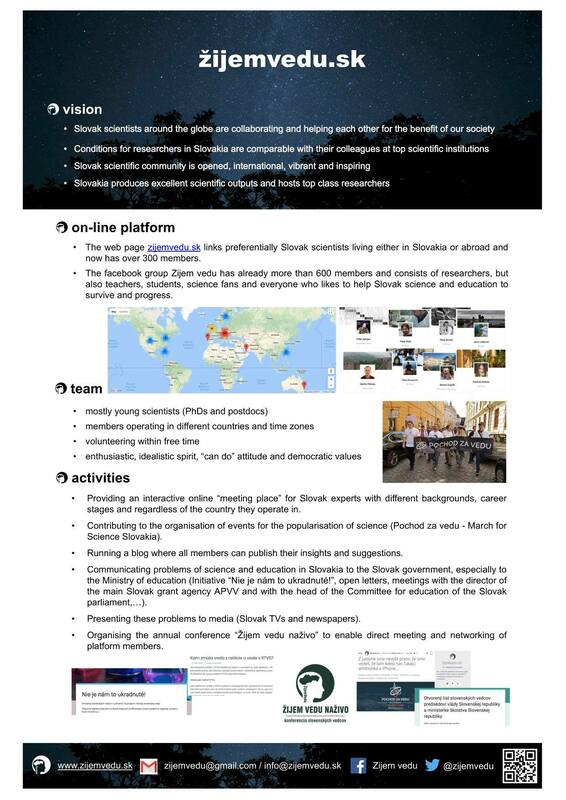 All of this is happening completely on the volunteering base and exclusively within a free time of our members operating in different countries and time zones. We do not have any kind of financial support yet, only a huge enthusiasm and tons of ideas. If you also want to be part of our community, just sign up at www.zijemvedu.sk. In case you would like to contribute more actively or have a particular idea to share with us, just contact us at zijemvedu@gmail.com or info@zijemvedu.sk. You can also join the facebook group: Zijem vedu. Our Twitter account is @zijemvedu.